The BP-operated Prudhoe Bay oil field in Alaska has reached 40 years of production, a milestone highlighting its historic contribution to US energy security and ongoing role as a key economic engine for the region and nation. Since the giant oil field on Alaska’s North Slope began production, it has generated more than 12.5 billion barrels of oil – far exceeding initial projections – making it the most productive US oil field of all time. Today, while production has fallen from historic peaks due to natural decline, Prudhoe Bay remains the third-largest oil field in the US by proved reserves, behind the Eagle Ford Shale and Spraberry fields in Texas, and a major source of domestic oil production, with current output at approximately 281,800 barrels of oil equivalent per day. In addition, Prudhoe Bay continues to support more than 16,000 Alaska jobs and supplies 55% of all Alaska oil production. And over the last four decades, the State of Alaska has earned USD 141 billion in revenues from North Slope production and development. 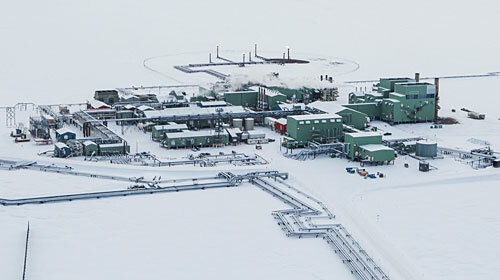 Prudhoe Bay is operated by BP in Alaska. The working interest owners include: BP, 26%; ConocoPhillips, 36%; ExxonMobil, 36%; Chevron, 1%.